That is to say, if I knew what I know now, I probably wouldn't have been to Murano five years ago (and miss out on the glass-making tour, but the lack of glass art display in my house tells me that I would be totally fine with that). 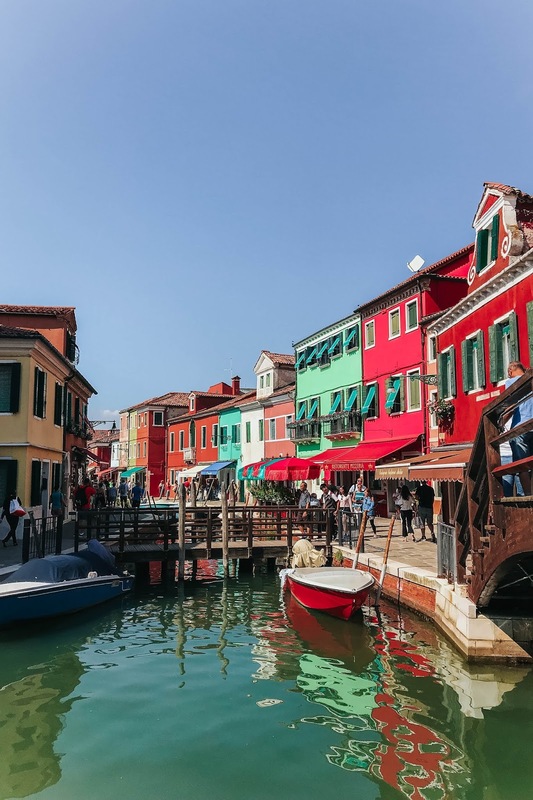 No offence to Murano, of course, as it is still just as beautiful, but in this age of visuals, who can resist the colourful Burano? What happened five years ago doesn't matter now because — lucky me, I know guysss — I get another chance to visit Burano, and oh how I wish I could spend an entire day there. Burano has to be the cutest fisherman village ever, with its rainbow-hued blocks of buildings. I could imagine shooting a dozen outfits against the backdrops of Burano walls alone! 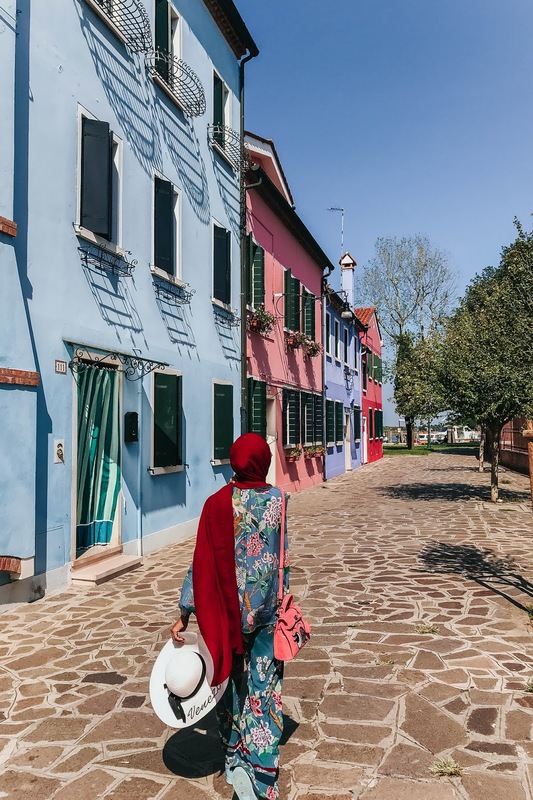 I wanted my outfit to Burano to match the surroundings, without blending in too much, but not clashing either (yep, not asking for too much here, am I? ), so I thought my matching set from the GP & J Baker x H&M collab was perfect for the day! 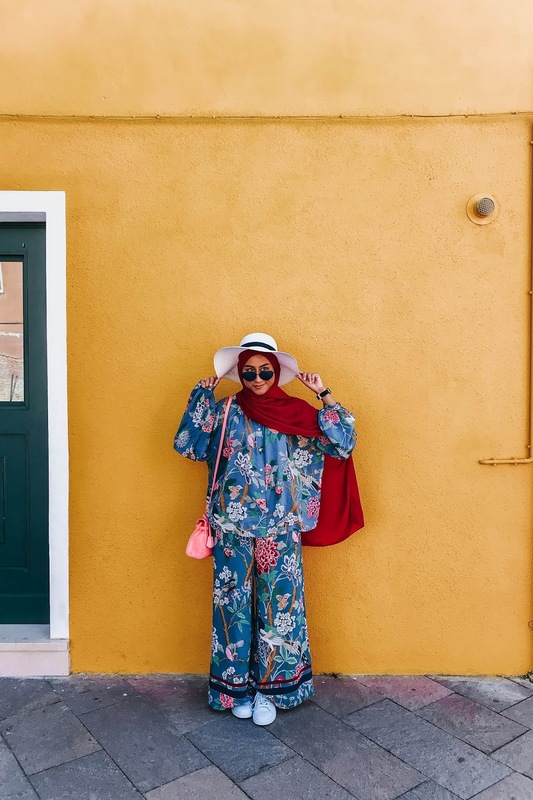 I love the idea of wearing prints in a bright fun shade against the rainbow blocks of Burano while adding some colour-blocking with my bright red shawl, aqua sneakers, and my cheeky Playnomore bag. See: The first time ever I wore the pink Playnomore bag when my old camera blacked out, yikes! 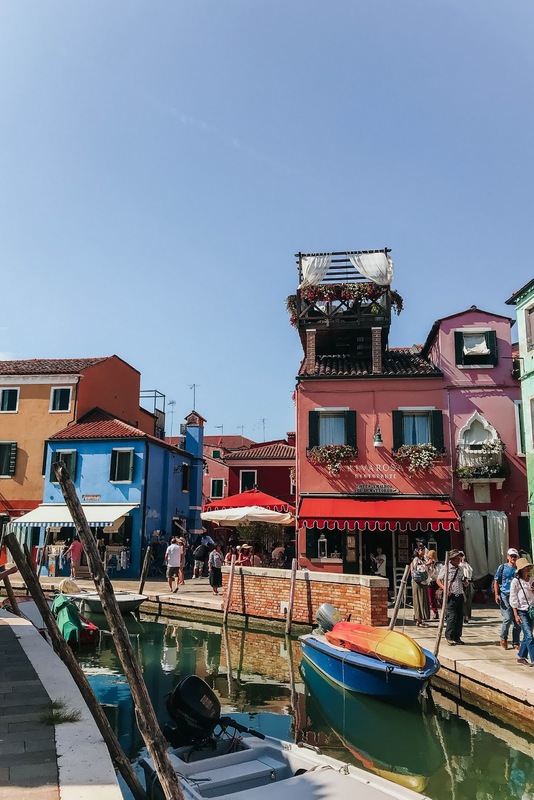 One thing to know about Burano island: the attraction is the colourful blocks of homes, as there isn't much else to do other than oohing and aahing over the different vibrant painted walls. The locally-made lace could be of interest too, if you're into that sort of thing; they even have a museum with a school of lace to preserve this ancient tradition of their craft. The buildings were originally painted in these saturated colours to aid local fishermen navigate their way back home in foggy conditions. There is a set of strict colour codes for different parts of the city and the homeowners have to adhere to them (the different sets can sort of be seen in my snaps here! ); if they wish to repaint their home, an official request has to be sent to the municipality for approval. Love the dedication to aesthetics, I have to say! 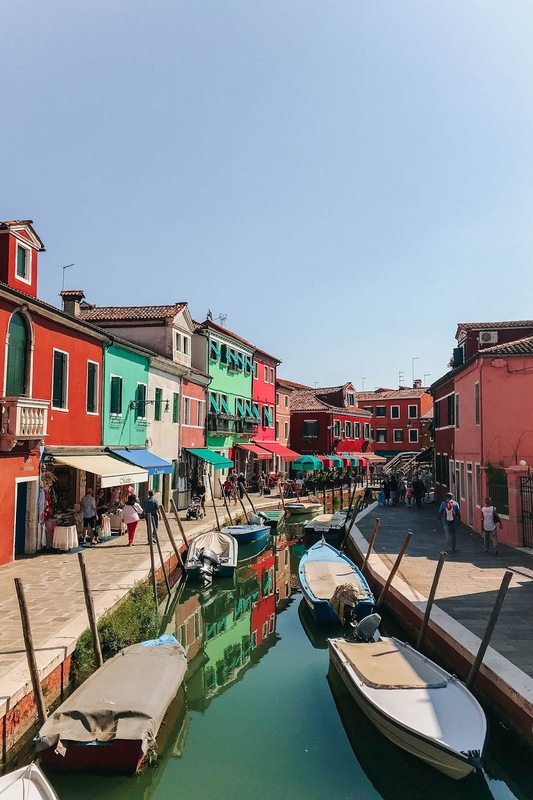 Leonardo da Vinci visited Burano sometime around 1481 to purchase a lace cloth for Duomo di Milano and their lace trade soared from there onwards. There are no actual hotels on Burano so tourists rarely stay here overnight, and when they do they rely on B&Bs. 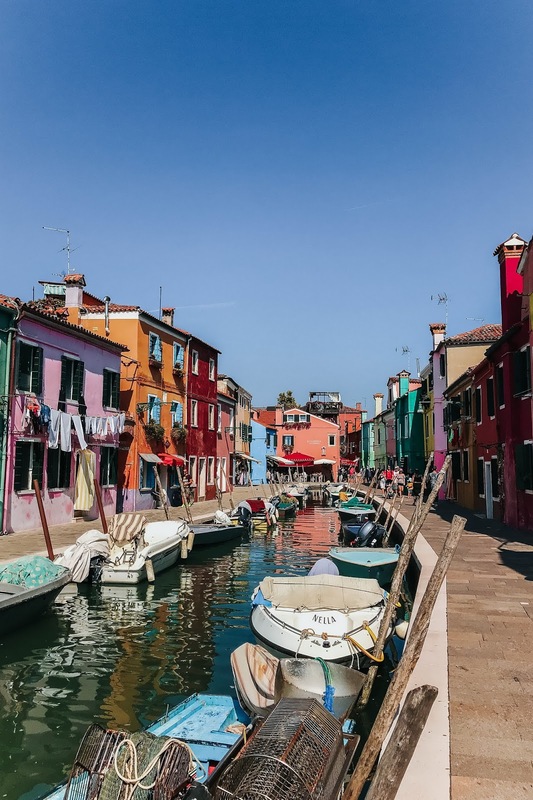 Burano is about 40 minutes away from Venice but if you're precise about time, you should allocate about one hour of travel between the islands as the vaporetti, which is what they call their water taxi, runs on a schedule. 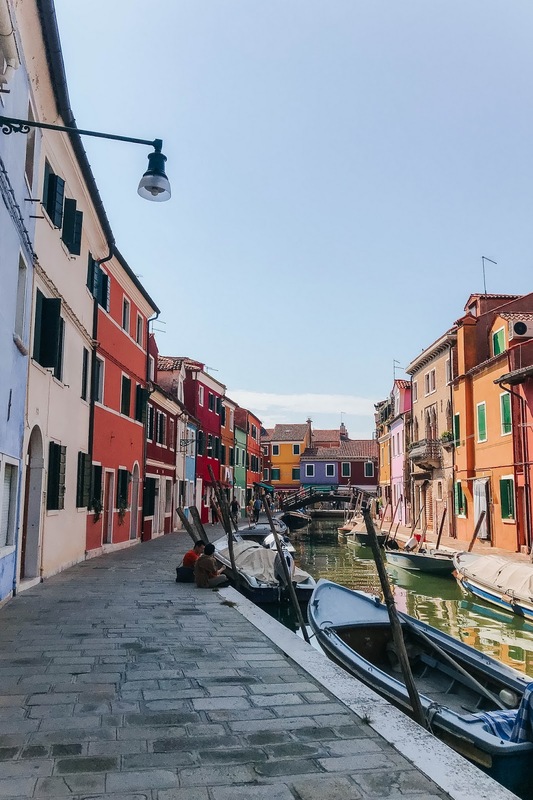 I've done my fair share of travelling and personally favour hotels over B&Bs, so staying in Venice and doing a day trip to Burano is a better option for me — and probably for you too to be honest, as accommodations aside, the best restaurants are located in Venice! Goodness what a beautiful post! You chose your outfit for this occasion so well Liyana! I love the floral print and it really is perfect against the backdrop of all those beautifully colorful homes. Shah and I did manage to have a somewhat romantic lunch here, haha! It would've been more romantic if we didn't have to rush through it to head back to our hotel to catch our train back to Milan though, but I'll always remember trying out a dish in beautiful Burano!